I have never received an award for blogging before. Given the sporadic nature of my posts, it’s no small wonder. 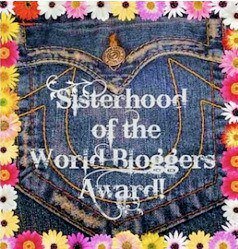 Yesterday, the lovely MJ of Thrivingisthegoal.com nominated me for a lovely blogging award. A first award is always special and I am thankful to MJ for thinking of my and my little home in the blogosphere. So, thank you, MJ. If you could become fluent in a foreign language in one year, then which one would you choose? I would love to be fluent in Hebrew if for no other reason than to be able to read the Old Testament in the original language it was written in and to understand the nuances of the texts. That and I think Hebrew is a very interesting language. If you had a million dollars that you had to donate to one charitable cause, then which one would you pick and why? Only one charitable cause? That’s hard. Hmm…I know a lot of people who have spouses in one branch or another of the military and the stories I hear about lack of mental health services for both those who return from tours of duty with emerging mental health issues, reintegration issues, and the lack of services for family members makes my heart break. I would love to donate money to a charity such as the National Military Family Association. If you could master a new skill in a year by taking a class, then what skill would you most want to learn? I am not the most creative or knowledgeable in the kitchen and would love to learn more about food science and cooking in general. What novel have you read more than once by choice? There are soooooo many novels I’ve read more than once by choice, goodness. The novel I have probably reread most often as an adult is This Heart of Mine by Susan Elizabeth Phillips. If you were allowed to go back to high school and change one thing, what would you change? When Mark C. told my friend he thought I was amazing, I would have thanked him for the compliment and asked him if he would like to go out for coffee at Tim Hortons some time instead of brushing it off as an untruth because I had such low self esteem a cute and talented boy couldn’t possibly be interested in me. What are you presently looking forward to? I am looking forward to starting my novel writing again. It’s been a long time since I’ve written and I’m starting to feel that electric tingle that comes with a book idea that is just too good to not play with. What food do you absolutely hate and refuse to eat no matter what? Hands down, brussel sprouts. I don’t care if they really do taste better roasted instead of boiled, I am NOT going to eat them. If you were to get a tattoo, what would be it be and why? If you already have a tattoo(s), what is the story behind one of them? Where is your favorite place to be and what makes it special to you? The world is going to end in five minutes. What is your deepest regret? If you just won the lottery, what is the first thing you would do with your new found wealth? What is a book , fiction or nonfiction, that has impacted your life? When you think of the word beauty, what comes to mind? If money was no object, what vocation or career would you pursue? What do you most hope to be remembered for? If you have some time to yourself, how would you spend that time? Thank you again, MJ for your nomination! I enjoyed answering your questions and hope my answers are just as enjoyable for you and my readers.